Duke Energy plans to spend $50 million for a 10-MW project amid criticism from consumer advocates and its business customers. Duke Energy on Thursday presented to the North Carolina Utilities Commission a revised distributed solar project that calls for spending $50 million instead of $100 million to install solar panels on rooftops and the ground. The utility filed the revised proposal earlier this week after facing strong objections from commercial customers and the commission staff representing consumers, reported the Charlotte Observer. Other critics contend that Duke didn't give non-utility solar power producers a chance to participate, but the utility said it has sought bids from those producers. Duke's chief technology officer David Mohler touted the original proposal as late as last week, when he appeared on a panel discussion at the Solar Power International conference in San Diego, Calif.
Duke previously proposed a $100 million project to install 20 megawatts of panels on the roofs and the ground of homes, businesses, schools and factories in central North Carolina. The two-year installation plan would cover up to 850 locations, generating more than 16 megawatts of power to feed the grid (see Duke Eyes Residential Rooftops). Under the new proposal, Duke will spend $50 million to install 10 megawatts of solar panels at up to 425 locations to get roughly 8 megawatts of energy. The utility, which will operate and maintain the solar panels, will still spread the project over a two-year period, said Paige Sheehan, a Duke spokeswoman. Since the utility announced the proposal in June, it has had to contend with a series of complaints. Consumer advocates at the utilities commission said the project was too expensive and unnecessary for Duke to meet the state's renewable energy requirements, particularly when Duke already has another, 16-megawatt solar project underway with SunEdison (see SunEdison to Build Largest U.S. PV Farm). North Carolina requires its utilities to get 12.5 percent of its power from renewable sources by 2021. 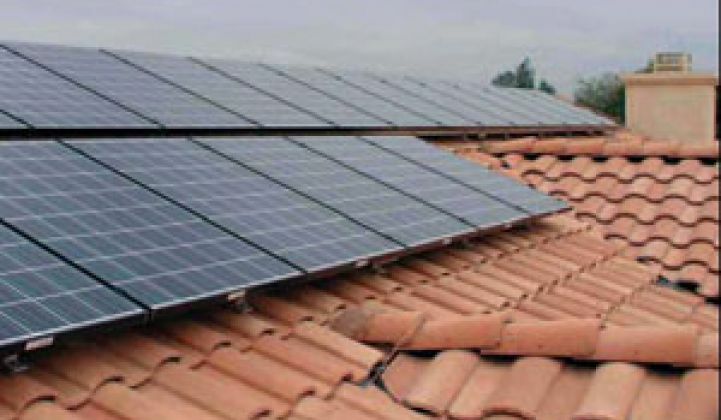 The state law mandates the inclusion of solar power, starting in 2010. By 2018, the share of the solar power needs to go up to 0.2 percent. About half of the states in the country have similar laws to promote renewable energy, prompting utilities to sign contracts with mostly solar and wind power developers to get long-term energy supplies (see California Offers Plan to Clear the Air and PG&E to Buy 800MW from OptiSolar, SunPower). The commission staff also contended that the original, $100 million project could hamper cheaper renewable energy development because Duke would have received so many solar credits that it would have no incentives to carry out more projects for some time when the cost of solar power becomes lower. Meanwhile, Wal-Mart and Kroger, a grocery chain, complained that they would have to pay a lot more for power since Duke can pass on the cost of the project to ratepayers. The increases will be 42 cents per month for commercial customers and $4.25 per month for industrial users. Duke's project sets it apart from other utilities that have opted to buy solar power instead of owning and operating their own plants. But more utilities could enter the solar power generation business themselves, thanks to a recently passed legislation that will provide solar investment tax credits to utilities (see Utilities to Hit Solar Scene). The utilities commission won't make a decision on Duke's project Thursday, and no date has been set for the final consideration, Sheehan said.